This summer is seeing some brilliant trends in fashion and jewellery has come to the forefront of all this! The ever popular nautical theme is back and anchors are huge in jewellery at the moment! Anchor and Swallow Double Ring £3.50. Geometric shapes are everywhere at the moment. Whether it's a bold geo printed dress or a glorious chunky geometric necklace and triangles are the hottest shape! Shiny, chunky statement bracelet cuffs are a must have for your wrist this season. Yes Shamballa sets are very trendy at the moment! These cute glistening beads come in so many beautiful colours, be it in a necklace, earrings or bracelet. Though if you think it's simply a trendy fad think again, as Shamballa holds a very historic meaning behind the beads. Shamballa is a mythical kingdom that Tibetan Buddhists believe in and they hold a spiritual meaning to search and believe. This new take on wearing a cross necklace swept the globe with celebrities adorning the beautiful pieces. Crosses are big in fashion right now too, I'm sure you've seen crosses on leggings, tops, nails and of course jewellery! The great thing about the side cross necklace is that it's so dainty and delicately beautiful you can wear it with anything! Forget modern and retro, this jewellery trend has travelled us back in time to the 1900's! Antique bronze has taken over the gold and silver coloured jewellery giving rings and necklaces a great vintage look. Handmade Nail Polish Rings available for £5.00 in various colours. 7. Stuck in the Midi! Knuckle rings have taken over! Instead of wearing a ring normally low down on the finger, knuckle rings are worn in middle of finger above the knuckle. Available in various designs for £4.50. Still going strong is the massive Moustache trend! Popular everywhere, whether it's a cushion, top, nail art or jewellery! Once bracelet just isn't enough for this particular trend, from Bracelet Stacks that incorporate multiple bracelets into one wrist piece, to Bracelet Sets that offer trios of separate bracelets as a set. Bracelet Set for £8.00 for all 3! They're back! Yes the hugely popular 90's trend has returned and this time it's bigger and better than ever! All these gorgeous items are available to buy now from Melody Moo. Melody Moo is currently in the process of designing a new Jewellery range! Metal stamped jewellery which will be available for personalisation whether it's your name, a favourite date, pet or loved one for all occasion's..Births, in memory of, weddings, christenings, birthdays, anniversary's. .The range will be sure to 'pack a punch' and be a brilliant addition to Melody Moo. Also in the making is a new collection of handmade Retro pin Up Ladies on bold cabochons necklaces and rings! Top coats are usually clear and used to set your finished manicure. 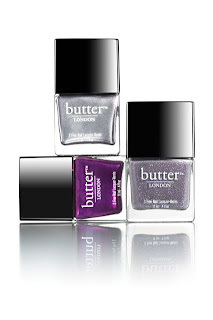 However, Butter London offer a way to add top coat that will transform your manicure into something much more exciting!! then there's 'Knackered'. 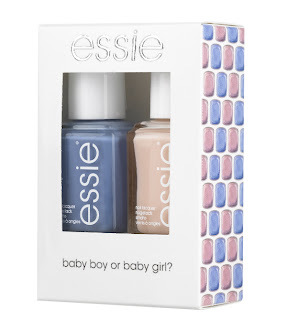 A brilliantly fun name for a sheer shimmery blue duo chrome lacquer that works perfectly with blues and greens. Last, but by no means least, is their Matte Finish Top Coat which of course will transform any manicure to this seasons hottest shine free trend. The application of this polish is near perfect! It took just one coat with no streaking or running!Drying time was fairly quick ( about 10 minutes with top coat).The finish is an ultra high shimmer and gloss. Miss Bliss is not the sparkliest of the holographics I have tried I have to admit, but it still offers a luscious sparkle and shine. As you can see I also took a picture with the flash to try to capture just how amazing and shimmery this polish was, as I feel the other pics don't do it justice! Despite it being slightly less vibrant than the other Holographics from Color Club that I have tried, I still absolutely adore Miss Bliss! I have worn it numerous times and use it as my 'go to' sparkly polish for a quick smooth manicure. Turquoise, Pink, White nail polish. Black Nail Art Pen or polish. Step 1: After applying Base coat and drying, paint nails using the turquoise. Step 2: Once dry, using the pink, draw small rough triangles on the nails (see picture) using the nail polish brush itself. Step 3: Once dry, apply smaller white triangles inside the pink triangles. Step 4: Whilst the white triangles are still wet (so you may want to do one nail at a time) take a toothpick and quickly push out the white edges to make fuzzy. Step 5: Take the black nail art pen (or use black polish and toothpick) and draw a scribbled fuzzy black outline around the pink triangles. Step 6: To finish add small black triangle blobs within the white triangles and once dry apply top coat. There you have it! A simple Ikat pattern to your nails. You can combine different colour combinations too. Part of the new Summer 2013 Sunsational Collection! This is a gorgeous turquoise crème. With summer here I wanted a really bright luscious turquoise and this did not disappoint! The shade is a vibrant and beautiful turquoise blue that goes on as a crème and dries with a high shine smooth finish. Too Yacht to Handle applies like all other China Glazes. Simple application with a slightly thin brush and formula can sometimes be a tad runny. But overall, the application is smooth and the polish has a standard dry time (15- 45 mins depending on how many coats have been applied). If you're looking for a gorgeous summer blue or turquoise I would definitely recommend this! Chosen nail polish (I used Saffron Black). Matte Top Coat ( I use Boots No 17). Dental Floss Pick (See pic below). Dotting tool and Caviar beads (optional). 1. Paint your nails in chosen colour until almost dry (may need one or two coats depending on your polish). 2. Apply Matte top coat quickly to your nails (or you may prefer to do one nail at a time). 3. Leave for few minutes, then whilst nails are still soft (but not wet or tacky!) take your floss pick and is the floss like a saw to create a criss cross effect. 4. Using the dotting tool and a small amount of clear polish or nail glue ( and I mean small or it will seep onto the matte and make parts shiny). 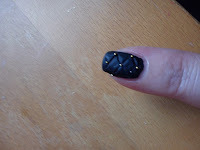 carefully place caviar beads onto the corners of the criss cross to complete your quilted nails. There you have it, very simple quilted nails! Don't worry if you don't get it right straight away, it took me a couple of tries when I first started. The key to getting this right is to get the nails dried just enough to not be wet or tacky, yet not enough to be completely dry, which can take some practice and really does depend on the nail polish that it used as they all vary and have different drying times. So I've been intrigued by the leather effect trend so I decided to buy Nails Inc Bling It On Leather Effect polish in Black. All I can say is WOW! This nail polish has AMAZED me and I absolutely LOVE IT!! 1. It really does look like leather! I was curious as to how nail polish can be made to look like leather but somehow Nails Inc have...well...nailed it! 2.I put 2 coats on like it says to and the drying time was outstanding! It only took just a few minutes for 2 thick coats to dry with no top coat. 3. The application was smooth and easy. 4. the finish was a rough textured leather effect! 5. I dubiously placed on the skull and crossbones that comes with the polish set as the 'bling'. I say dubiously because in my experience 3D embellishments often don't stay on long, especially when you're a busy mum and nails go through a lot! But...after a week the skulls were still on!!! 6. Finally, as far as chipping and wear time goes...No chips! !..No cracks! !...No smudges!! and well over 7 days continuous wear! !